Y.C. Chuang, Y.L. Ke, H.S. Chuang and Y.S. Wang, "A Novel Single- Switch Resonant Power Converter for Renewable Energy Generation Applications", Industrial & Commercial Power Systems Technical Conf., May, 2013, pp. 1-9. C.J. Tseng and C.L. Chen, "Novel ZVT-PWM converters with active snubbers", IEEE Trans. on Power Electronics, Vol. 13, Iss. 5, pp. 861- 869, 1998. D.S. Gautam and A.K.S. Bhat, "A Comparison of Soft-Switched DC- to-DC Converters for Electrolyzer Application", Vol. 28, No. 1, pp. 54- 63, 2013. I.H. Baciu and S. Lungu, "Resonance in Power Converters Circuits", IEEE 18th Int. Symp. For Design and Tech. in Electronic Packing, Oct. 2012, pp. 183-187. S. Urgun, "Zero-voltage transition-zero-current transition pulsewidth modulation DC-DC buck converter with zero-voltage switching-zero- current switching auxiliary circuit", IET Power Electronics, Vol. 5, Iss. 5, pp. 627-634, 2012. E. Jayashree and G. Uma, "Analysis, design and implementation of a quasi-resonant DC-DC converter", IET Power Electronics, Vol. 4, Iss. 7, pp. 785-792, 2011. T. Mishima and M. Nakaoka, "A Practical ZCS-PWM Boost DC-DC Converter With Clamping Diode-Assisted Active Edge-Resonant Cell and Its Extended Topologies", IEEE Trans. on Industrial Electronics, Vol. 60, No. 6, pp. 2225-2236., 2013. L. Jiang, C.C. Mi, S. Li, C. Yin and J. Li, "An Improved Soft- Switching Buck Converter With Coupled Inductor", Vol. 28, No. 11, pp. 4885-4891, 2013. N.N. Goryashin and A.S. Solomatova, "Analysis of MOSFET Operating in Half-Wave Zero-current Switching Quasi-resonant Converter", XIII Int. Conf. and Seminar on Micro/Nanotechnologies and Electron Devices, July 2012, pp. 333-337. R.W. Erickson and D. Maksimovic, "Fundamentals of Power Electronics", Springer Press, 1997. G. YANIK was born in Istanbul, Turkey, in 19 He received his B.S. and M.S. degrees in Electrical Engineering at Yildiz Technical University, Istanbul, in 2008 and 2011, respectively. He is a Research Assistant in the Department of Electrical Engineering, Yildiz Technical University since 2008. His research interests include DC-DC converters, soft- switching techniques, power factor correction and inductor design. E. ISEN was born in Bandırma, Turkey, in 19 He received his B.S., M.S. and Ph.D. degrees in electrical engineering at Yildiz Technical University, Istanbul, in 2003, 2005 and 2012, respectively. Assistant Professor in the Department of Electrical and Electronics Engineering, Kirklareli University. His current research interests include grid connected inverters, renewable energy conversion systems and power electronics. ISNAD Yanik, G. , Isen, E. . "Quasi-Resonant Full-Wave Zero-Current Switching Buck Converter Design, Simulation and Application". 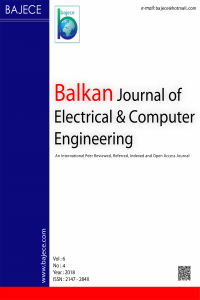 Balkan Journal of Electrical and Computer Engineering 1 / 2 (June 2013): 71-77.